This is the terrifying moment a passenger jet narrowly averts disaster after being buffeted by high winds as it comes into land at a UK airport. 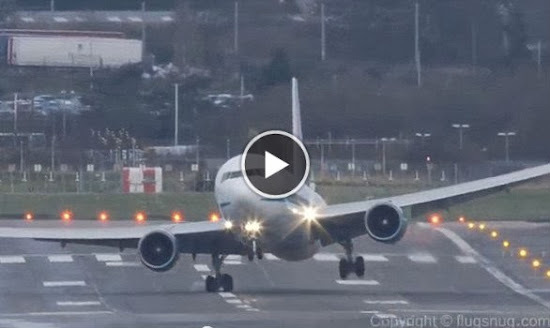 Video footage shows the Boeing 767 swaying wildly in the air in crosswinds of up to 40mph. But the pilot skilfully manages to keep control by appearing to bring the plane down at a steeper angle than the normal descent. As a result, the jet bounces onto the tarmac, first with the right-hand set of landing gear and then onto the left, throwing up clouds of smoke. The incident took place at Birmingham Airport. The video, titled 'landing gear banged to its limits', has been viewed more three million times since it was uploaded to YouTube on Sunday. Many users have praised the pilot, but also the way the landing gear coped with the impact. YouTube user flugsnug, who uploaded the clip, has also posted several other videos of landings at Birmingham Airport in rain and high winds.